DIY-Shack: Halloweens Icy Hand of Death for your party punch bowl ! Halloweens Icy Hand of Death for your party punch bowl ! OK, so your planning your annual Halloween bash, and you are looking for something different to do this year. 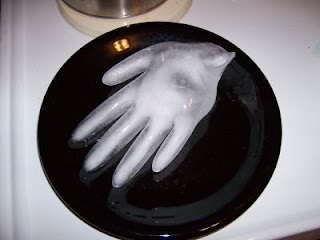 How about adding the Icy Hand of Death for your party punch? You need latex surgical gloves for your Icy mold. I recommend that you rinse the glove(s) thoroughly with scalding hot water a few times to remove any powder or additives that might be in the gloves you use. I don't have to tell you to use new sterile gloves do I?. You can purchase these at any pharmacy in town by the box and they are handy for other things too, so it doesn't hurt to have them around. After rinsing thoroughly, fill the glove to just a little above the thumb line on as the water will expand some as it freezes. After the glove is filled to the right level use clothes pins to secure the glove in an upright position to the freezer door tray in your refrigerator. 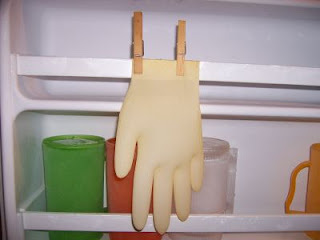 Other options are to tie the glove closed and lay the glove over and object and place in the freezer. This will give the effect of the hand clinching or grabbing. I am sure if you think on it awhile, other ideas will occur to you. Please resist the urge to position the glove in any offensive juvenile gestures, as you are being childish enough in even doing this. If a punch party is not what you had in mind, I think you might even fill your hand with Koolaid, insert a stick into the wrist, and come out with a truly unique frozen confection. I shiver to think what might happen with jello and a latex glove. Freeze overnight for best effect. To remove the glove from the hand run a little tap water over the glove surface. Then just peel the glove off of your Icy Hand and place in your punch bowl.